In his May 10th El Paso speech, Obama once again calls for passage of the DREAM Act, recognizing illegal aliens as legal residents for tuition purposes and putting them on the path to citizenship. He bemoans the fact that they have almost passed it at times and feels betrayed that former supporters have backed down. He doesn’t understand that public support has eroded for the DREAM Act as more people become familiar with it and see it as a bad idea. Former sponsor Orrin Hatch has backed away from it in a fight for his political life. Let me try to explain my reasons for opposing DREAM. First is the LOCAL expense, a key problem with Washington. They pass all these laws and heap mandates upon us, garnering the appreciation of their special interests in the process, and leave us holding the bag for the costs. 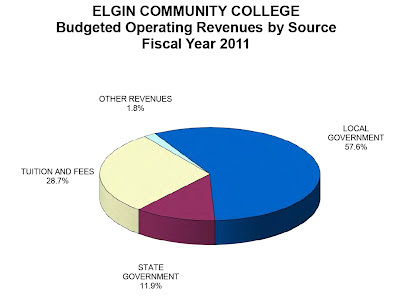 Here’s where the money comes from for in-state tuition at our local community college. Note that 57% of the revenue comes from my property taxes. All the state revenue sources combined (INCLUDING the pass-through federal grants) comes to 12%. So what the DREAM Act is telling me is that after paying to educate the children of illegal aliens from K-12 at an average cost of $7,500 per year you are now going to charge me to educate them for four more years? And at the end you are going to reward them with citizenship? Oh, and they’ll be competing with our own graduates for the few jobs out there. I happen to live in a town where the immigrant and illegal alien populations have exploded over the last two decades. Over 41% speak a language other than English at home. One in five public school students are currently enrolled in bilingual classes. And we are paying for it through some of the highest property taxes in the nation. Kane County ranks 30th in the nation according to The Tax Foundation. We pay 1.98% of our home value every year in property taxes, over TWICE the national median of 0.96%. So, we mind very much that we are paying the school district to educate the children of trespassers and do not choose to pay added community college taxes to subsidize them further. Besides, why do they get a break when students from other states do not? What’s the rationale there? Don’t pander to me, telling me that they are like our own citizens and were brought here as children. Perhaps setting the example of consequences for breaking the law will discourage others from coming here illegally. They are NOT Uncle Sam’s responsibility; they have parents who brought them here. And I don’t see Mexico’s President Calderon sending us checks to cover the cost.